Tomorrow, from 1-4 pm in room 405 Parks Library, Special Collections & University Archives (SCUA) will have selected treasures on display. We will have artifacts, rare books, films, student publications from the 1960s, and other wonderful items from our collections. Please drop by. All are welcome! For the preservation of our treasures, please leave food & drink outside. The video above documents the types of activities found in soils and farm crop courses at Iowa State University. Check out another of our YouTube videos on soils: “Grass Roots in the Soil” Part One and Part Two. Find more collections by searching our holdings at the search box on our home page. Learn more about World Soil Day at the Food and Agriculture Organization of the United Nations campaign site. One of the early successes of the station occurred in 1951 with the acquisition of a $260,000 grant from the Ford Foundation’s Fund for Adult Education. This money allowed WOI to produce a series of public affairs programs titled “The Whole Town’s Talking.” These programs looked at issues affecting central Iowans and illustrated how the community members debated matters such as school consolidation, community infrastructure projects, and juvenile delinquency. This award-winning series was directed and produced by Charles Guggenheim, who later in his career would direct a number of Academy Award-winning documentaries and become a media advisor for several presidential campaigns including Robert Kennedy’s. When the University sold WOI-TV to Capital Communications Company in 1994, the University Archives acquired the paper records of the television station along with thousands of 16mm films and videotapes. These films offer a glimpse of what local television programming was like in the 1950s and some of these films have been digitized and are available on our YouTube channel. You can judge for yourself how successful the station was at providing educational programming that was both interesting and entertaining! If you see anything of interest, contact us, or better yet stop in and see us! Here in the Special Collections Department, we have all sorts of collections – university archives, manuscript collections, rare books, photographs, and the focus of this blog post, films. What kinds of films do we have, you ask? Primarily they are films produced by and about Iowa State University and its interests – agriculture, science, technology, home economics, etc. When I refer to films in this post, I refer to various motion picture formats: VHS tapes, 16mm film, DVDs, U-Matic tapes, and so on and so forth. We have just about every format in existence and we are incredibly fortunate to have the equipment to play them on. 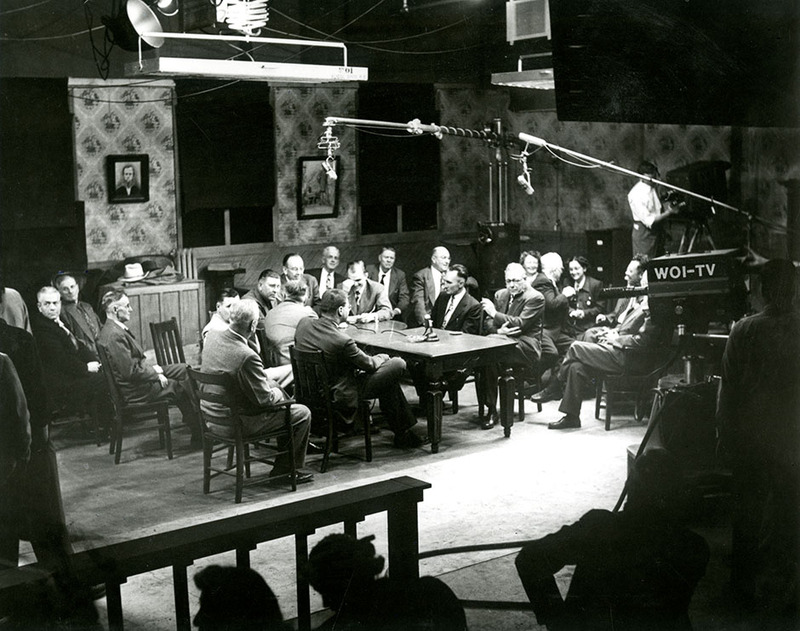 As some of you may know, Iowa State University ran the WOI-TV from its beginning in 1950 until 1994, when it was sold to Capital Communications Company, Inc. It was the first television station to be owned and operated by an institution of higher education in the United States. From 1951 to 1994, it was home to the popular television show Magic Window, hosted for its last 40 years by Betty Lou (McVay) Varnum. We do have some of these episodes on film (sadly, not all), so please contact us if you’d like to take a look at any. A few of the films can also be found on our Youtube channel, so be sure to check that out, too! Records of this program and others can be found in the WOI Radio and Television Records, along with lots of other information about the station. In addition to WOI-TV films, we also have general university and university-related films, which were largely created by the university. These go back as far as 1927 (how cool is that??) and as recently as the 1990s. Films of Iowa State’s campus span the 1930s and 40s, a scene of which is pictured above, taken from our Youtube channel. Also included are farm films, football films, and instructional films. Another noteworthy set of films are those of Philip H. Elwood, Professor of Landscape Architecture, dating from the 1920s and 30s that showcase his travels around America. A screenshot of one of his films is featured below, also taken from our Youtube channel. For more information on our collection of films, see our Film Collections webpage, which includes links to listings of many of our films and to our Youtube channel. Check it out: there is all sorts of fun stuff on there! Crowds watching canoes navigate Lake LaVerne during the 1934 VEISHEA. As American Archives Month draws to a close, we thought we would write one final post about how to find materials here in the Special Collections Department. Our previous post provides examples of online resources for figuring out what archives are all about, but we thought we should provide you with something specifically for our department here at Iowa State! We receive a whole wonderful variety of questions here. Sometimes researchers know exactly what they want, and at other times only a general idea. We sometimes receive questions such as “what do you have about the history of agriculture?” and “what do you have on the history of the university?” (the entire University Archives contains records and books documenting the university’s history). However, more often than not they are more specific questions such as “what can I find out about the person Lake LaVerne is named after?” Hopefully after reading this post everyone will be more familiar with the resources we have to help researchers find what they need in the Special Collections and University Archives! Landscape architecture students sketching at Lake LaVerne in 1942. 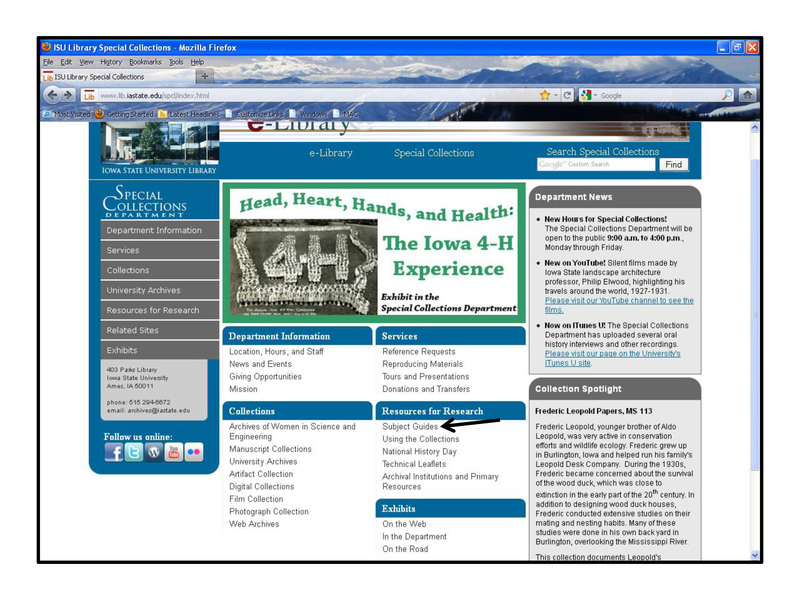 Another place to go for information on our collections and the history of Iowa State is our exhibits page. For Laverne Noyes and the building and history of Lake LaVerne, a good place to go would be the Iowa State University Sesquicentennial Exhibit, where the second link on the right will bring you to Iowa State University Campus and Its Buildings, where you can go to the section about Lake LaVerne. Interested in finding out about other alumni collections we may have, or finding other papers of people associated with Lake LaVerne? (For those who are not aware, archives keep papers and records of creators together for a whole variety of reasons. Here in the United States this is often called the “principle of provenance” and more on this can be found in the Society of American Archivist’s Glossary of Archives and Records Terminology). People associated with Lake LaVerne include President Raymond Pearson (who was president during Lake LaVerne’s construction and his papers contain the Lake LaVerne-O.C. Simmonds report; Simmonds was the landscape architect Noyes hired to investigate possible improvements to the campus) or Anson Marston (Marston helped restore Lake LaVerne, and a number of documents relating to this are in his papers). You can either search our website or look at the appropriate record series (arranged hierarchically) under our University Archives listing. Looking for photographs? You can visit our Flickr site. Other sites can be found from here. On Flickr, if you type “Special Collections Department, ISU Photostream” into the search box and click on our name in the selection which appears, you can search the photographs we have upoaded. You will then see all of the photographs of Lake LaVerne we have on Flickr (however, please note that we HAVE NOT scanned all of our over one million university photographs; if you would like to see more, please come and visit our department). Although most photographs are on Flickr, you might also find some (including documents) on the Digital Collections website. Lake LaVerne area under construction in 1933, when attempts were made to reduce the silt and other sediment build-up in the lake. This photograph, along with many others, can be found on our Flickr site. In addition to the University Archives, our department holds manuscript collections. Our manuscript collections contain records by creators not necessarily related to the university, but often are related to the university’s research strengths such as agriculture, science and technology. In your search for collections related to Lake LaVerne, you may want to just search the search box on the manuscript collections listing page, or take a look at our manuscript subject guides and look under landscape architecture. There is a lot to explore on our website, so please do so if you are interested! Of course, you could also search the library’s search system (where you can find books, films, and other resources on Lake LaVerne…or your research topic) or come on up to the fourth floor of Parks Library to visit our department and/or ask us your question(s)! If you are interested in finding out about our main collecting areas, you could also take a look at our mission and collecting policy, available online. This week, March 21-26, Iowa State University Extension is celebrating Extension Week. Check out their website for activities taking place on campus and throughout the state, such as here in Story County. The Extension Service first began here at Iowa State, even before a national extension program was established. As a land grant college, one of Iowa State’s founding principles was that higher education should be accessible to all. In the 19th and early 20th century, the Extension Service grew out of early activities such as Iowa State’s short courses for farmers and Perry Holden’s corn train. These were created from the need and desire to bring the ideas and research here at Iowa State out to the citizens of Iowa. In 1906 the Iowa General Assembly appropriated funds to create a Department of Extension at Iowa State College. The National Cooperative Extension Program was a result of the Smith-Lever Act (passed in 1914), which brought together the federal government, the states, and participating county governments as partners in a three-tiered organization to serve the nation’s farm population. Holden presenting during one of his corn train classes in a train’s passenger car. Holden’s short courses on corn were so popular that he decided to bring the course to farmers instead of having them flock to the Iowa State campus – and he did this on trains, nonetheless! To learn more about the history of the Extension Service, take a look at a video we recently uploaded to our YouTube channel. The video, Extension Heritage: Commemorating 50 Years of Extension Work in Iowa, was made in 1956 to celebrate Extension’s 50 year anniversary. 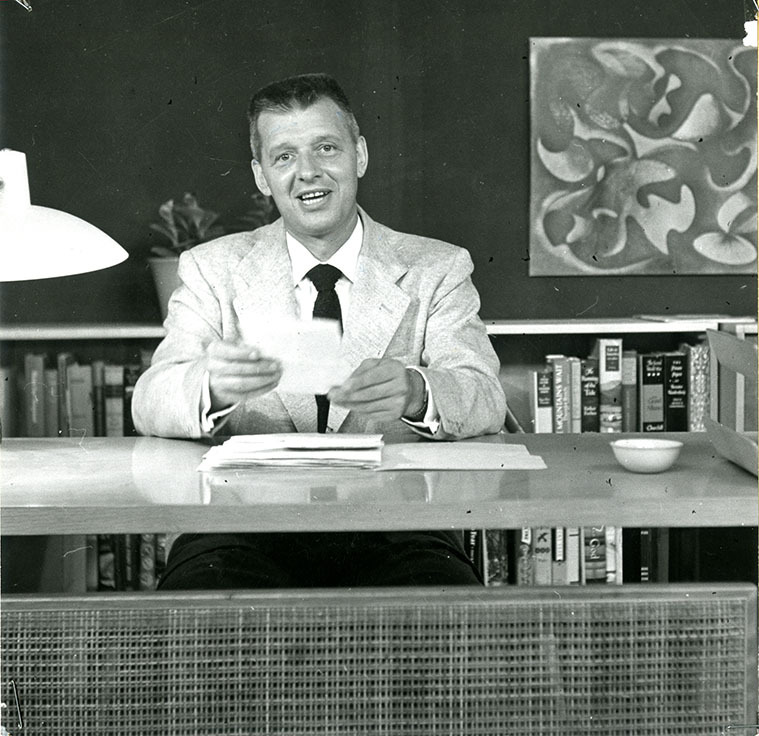 The video includes reminiscences of one of the founders of the Extension Service, Iowa State Professor Perry Holden. Holden laid the groundwork for the Extension Service (first called the Agricultural and Home Economics Extension Service), and was appointed its first director in 1906. In the video, Holden tells about giving 50 speeches in 3 days on his “corn train.” Holden also reminisces about these courses with a reverend who was on one of the trains on which Holden spoke. Among a variety of other topics, they discuss early extension work and past and future problems agriculture would face. 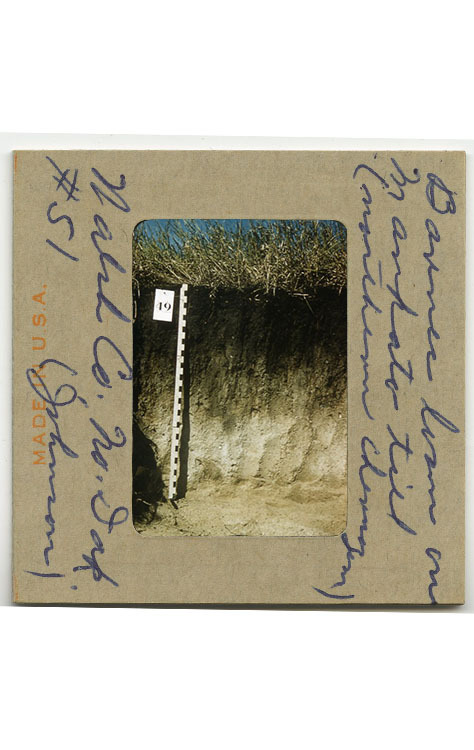 We have a variety of collections here at Iowa State documenting the history of Extension, such as the Iowa State University Extension Service Records. Other Extension related records and papers are listed here on our website. The collections listed include our Perry G. Holden Papers. Yesterday marked the 50th anniversary of John F. Kennedy’s inauguration, and last week the availability of the largest online digital collection of presidential papers (that of John F. Kennedy) was announced. However, as the search page for the digitized collection makes clear, the majority of the library’s collections remains undigitized and are available in their original, physical form only. As at the John F. Kennedy Library and Museum, libraries and archives all over the world are struggling to find the time and money to make even a small portion of their collections available online. Despite these obstacles, we here at Iowa State have been in the process of digitizing our collections over the past few years, and there are a number of new collections online which this blog hopes to highlight in the coming months. For instance, a new blog post from our Preservation Department’s blog describes the lantern slides from the Warren Manning Papers (prominent landscape architect), which are now available in our Digital Collections. Please take note that this is only a part of his collection, and the entire collection is available here in the Special Collections Department. If you would like to find out more, the collection’s finding aid/description can be found here. We have a variety of digitized portions of our collections in Digital Collections, in addition to photographs on Flickr, documents and publications on Scribd, audio on iTunes U, and films on our YouTube channel. We recently uploaded a number of films made by Iowa State landscape professor Philip Elwood (some of you may recognize the name from the former Elwood Drive, now University Boulevard). In 1923, Elwood was hired as a Professor of Landscape Architecture at Iowa State College (now University) and helped to organize the new Department of Landscape Architecture. He was made head of the department in 1929 and served in that capacity until 1950. During his time at Iowa State, Elwood conducted several summer travel tours for students to Asia and Europe, and throughout North America. These films document these travels, and I highly recommend you visit our YouTube channel to see them all since this would have to be quite a lengthy post if I were to highlight them all! You can limit the selections to only the Elwood films by searching for “Elwood” in the searchbox. However, please take note: if you are looking for exciting music and sounds with color images, please be aware that these are silent and in black and white. Even so, they are an interesting window into the early part of the 20th century both here and abroad, showing a different way of life (and landscape architecture!). One of these films include a trip from Japan to Hong Kong. Professors Elwood and Popham took 4 students (Bethane Carpenter, John Hall, Max Bird, and Norman Morris) on a tour of Japan, China, the Philippine Islands, and Hawaii in 1929. This videodisc covers highlights of the Korea, China and Hong Kong portions of that trip and includes footage of a train ride between Kamakura and Kyoto showing rice farms, the sacred island of Miyajima (Itsuku-Shima), a willow pattern tea house, temples, the harbor of the Whang-poo River in Shanghai, scenes of Hong Kong, the upper deck of C.P. SS Empress of Russia, and views of Hong Kong from the docks at Kowloon. There are also a number of films of Elwood’s travels throughout North America, including Tennessee (this film is in 2 parts). Elwood took students on a tour of the southern and eastern United States. In Tennessee they view a Confederate statue, homes in a small town, and boys playing football in a yard. From there they traveled on to view a new power plant with its lake, dam, and new community for its workers, dam construction, rural communities where girls are doing laundry outdoors in tubs, and a woman is standing over a tub on a fire. They also see a waterwheel working at a mill, logging, and mining operations. Then the group travels through the Great Smoky Mountains National Park. As mentioned above, please visit our YouTube channel to view more of these films, as well as many others. Also remember to keep in mind that if you are not finding what you need online, it is not necessarily because it does not exist but just might not be digitized! Search our website or the library’s catalog, or ask us, to find out what might be available.